It can be a drag not having a title for a motorcycle. It makes it more difficult to sell and it is certainly less desirable to buy a bike with “bill-of-sale only”. No one wants to buy a bike without a title (but often do reluctantly anyways). Having one will most certainly increase the number of people interested, and will therefore increase the value of any vehicle. Not having a title can make it difficult to register and ride it as a street legal bike (although not impossible). Maybe you have a bike without a title you want to sell or register. Maybe you want to buy bikes, but are always hesitant to purchase with “bill-of-sale only.” Below are a few legitimate options for trying to obtain titles for older machines, of which the paperwork has been lost or mishandled over time. These methods are not guaranteed and some that worked in the past may not work any longer as policies change over time and from place to place, but hopefully it will give you a few options that you perhaps had not thought of, and guide you in the right direction. Best case scenario is that the current owner has a clear title in hand and will additionally provide you with a valid bill of sale. But…things aren’t always this easy. This one works if the owner of record is cooperative. (I used this method to get rid of a junk car. Salvage companies won’t even take cars for scrap without a title.) You either know or can find out who the owner of record is, maybe with the help of a state record search. If they are still around, and you can find them, and they are cooperative, they can request a replacement title, receive it, and sign it over. Just be careful. If someone finds out that they still technically own something they have long forgotten about (or was actually stolen), they may want to keep it, or demand to be paid to sign over ownership. I never tried this method, because it sounds expensive, and because some of the other methods below worked out so well for me. It apparently involves signing an ownership affidavit, basically attesting that you personally know that the title history is clean, and pay the state a hefty fee, along the lines of $2500, for them to issue a “Bonded Title”. If you have experience with this please leave comments below. Admittedly, I didn’t do the paperwork for this method, but one of my bikes was titled this way by the dealer. It involves receipts for “significant portions” of parts used to “build” a bike, a state-assigned VIN tag that must be permanently affixed, and a police inspection. Unfortunately, this results in a title with the make and model listed as “homemade” or something similar with a year of manufacture of the “build” date. This can cause issues with insuring the bike, as they really don’t know what it is and if you explain that it is “really a Harley-Davidson” they will probably assume it is a big-bore v-twin, which may affect your insurance premiums adversely. I imagine having a newer year of manufacture can cause additional issues with emissions standards now-a-days in some states/regions. I don’t prefer this method, but if you are OK with the issues listed above, this could be an option. Sounds strange right? You are thinking, “This doesn’t apply to me.” But go ahead and read on. The rumor was, when I bought my bike, that the dealer had picked up my bike in Alabama during a cross country old motorcycle roundup trip. These bikes were often purchased in bulk “by the pile”, and didn’t have any paperwork. And, Alabama, like many states, didn’t issue titles prior to 1975 for this particular type/size of motorcycle. 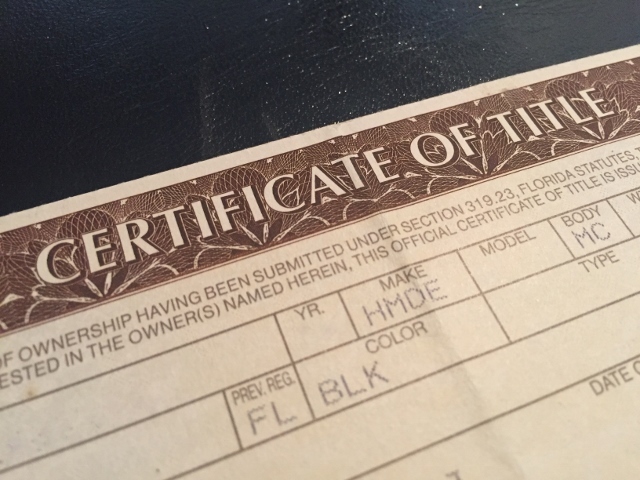 So for my first bike, which was pre-1975, I took my original bill of sale and a letter that I had requested from the state of Alabama, stating that they did not title motorcycles prior to 1975, into the Illinois Bureau of Motor Vehicles and was issued a new title, no questions asked. It had the original year, make, and model as well. Who knows, maybe your bike originated in Alabama (or a state with the same kind of policy) as well. OK, now this one worked in Indiana, but maybe other states have similar provisions. This required you to get a bill of sale from the seller, request an electronic title search by the state, and a police inspection, to verify the VIN. The electronic title search was to verify that there was no owner currently on record, but the search was only the Indiana database, and the electronic records only went back ten years. This seemed like minimal verification on their part, but I took advantage when it suited me. The police inspection was basically a checklist including a VIN confirmation, which we had done by the local sheriffs office. I titled several bikes (and jeeps) this way. So there you go. Just a few methods that are available for getting new titles for old bikes. Maybe now you will start to consider those bill-of-sale-only bikes and maybe get a deal. If you are trying to sell a bike, now you will have more interested buyers, and can maybe even ask a bit more for the price. Keep in mind that any time you buy a bike, regardless of title status, you need to get a bill-of-sale. A bill of sale is required for most of the title methods mentioned and is your proof of the sale transaction. I recommend downloading your state’s form, because homemade bills don’t always have the proper language in them. One time the bureau would not accept a hand-written bill of sale because it didn’t include the statement “Under penalty of perjury…”. I had to track down the seller and get him to sign the official state bill of sale before I could proceed. Also, if you have an old vehicle and don’t have a bill of sale and/or cannot get one from the seller, you could sell it to a friend (if you trust them), and have them sell it back to you and fill out another bill for that transaction. I hope that gives you some options. Leave comments below if you have any questions or more information. This entry was posted in Uncategorized by Aermacchi. Bookmark the permalink.